Last weekend it was my husband’s birthday and we had my mum staying with us for the weekend. It had been a weird week all round, mainly caused by the snow coming and going. It got to last Saturday morning and the weather had taken a turn for the worse. Overnight in our part of North Yorkshire about 10cm of snow had fallen. I didn’t fancy going out food shopping that morning. I looked in the fridge and saw we had lots of soup to use up but not much bread. We were eating out that night but I didn’t want to make a big meal. We had cheese and all the ingredients for the Sunday lunch the following day. So what could I make that would go with soup? I remembered the Cathedral City Best Loved Recipes book I had bought earlier on that week when I was in Morrisons. I thought about what I could make from the book and remembered there was a scone recipe in there. I never really make savoury scones, only sweet ones so I was keen to have a go seeing as the last time I made them was when the children were very young. I had got all the cleaning done ready for my mum getting here so out came the ingredients for the scones. I preheated the oven and prepared two of my baking trays with lining parchment ready for the scones. Then once all the ingredients were out I started on the scones themselves. Into a large mixing bowl I put wholemeal and plain flour along with some baking powder. At this point I was also meant to add salt but I completely forgot about it. 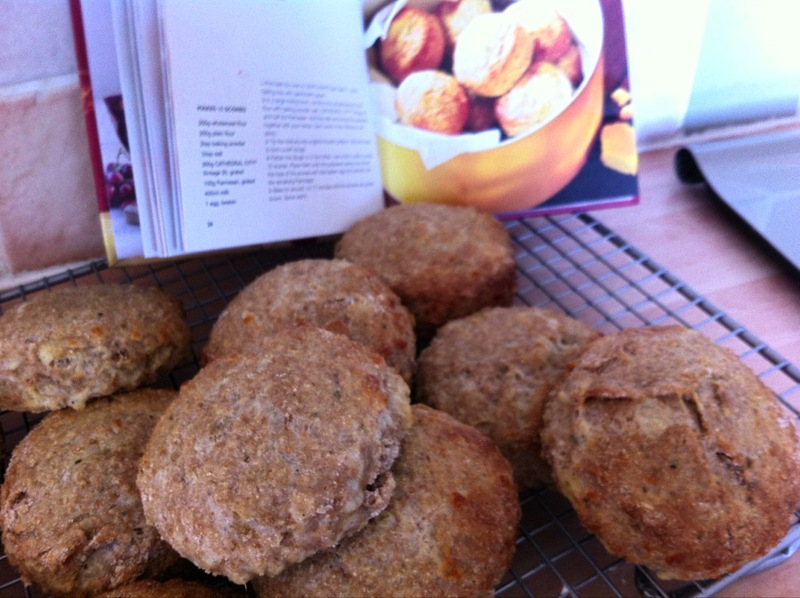 this I realised when I had made the scones and tasted one, thinking they were quite bland. I also added the Cathedral City cheddar which I had bought as a block so this had to be grated. It was a faff grating it as you needed 200g of it and my arms hurt by the time I had finished. I also had to add some Parmesan to the mixture. This was already grated as I had a bag of it in the fridge so it just got tipped in. I also decided to add a teaspoon of dried parsley to the scones, I would have tried chives but I couldn’t find them in the cupboard. I was convinced I had some left! The mixture was then combined with some milk, which made it into a rather sticky dough. I managed to roll out the dough easily though I did not roll it much as I like thick, chunky scones. I did not get 15 scones out of the mixture though, more like 9! Perhaps my cutter was too big, it was the middle sized one in my set. Once the scones were laid out on the two trays I brushed them with a little beaten egg before going into the oven to bake. They didn’t take long to bake, only about 15 minutes and they smelled delicious. As they were baking my hubby and daughter got back from Harrogate where she had been at her dancing class. What I hadn’t realised was that my hubby had nipped into the supermarket on the way home and had brought lots of Chinese nibbles like spring rolls and prawn toasts for lunch along with more soup, ciabatta bread, ham and olives. When I said I had already got lunch organised he didn’t seem impressed when I mentioned the scones. Well, these scones do not look exciting or that appetising. In the end I did serve them and everyone had one split and spread with some butter. As I bit into mine I felt disappointed, to me they didn’t taste of anything. Everyone else said they tasted lovely but I couldn’t taste the cheese, only stodge! I felt as they were very tasteless and lacked something. My mum said I could try a spoonful of mustard powder in the mixture next time, then I remembered what was missing- salt! The same couldn’t be said for these savoury scones. There were still four left in the cake tin in my cupboard on Friday (6 days after being baked) and this never happens in my house, everything gets eaten as if there’s a plague of locusts about. I had to chuck the cheese scones out. Oh well, one I won’t be baking again in a hurry then!